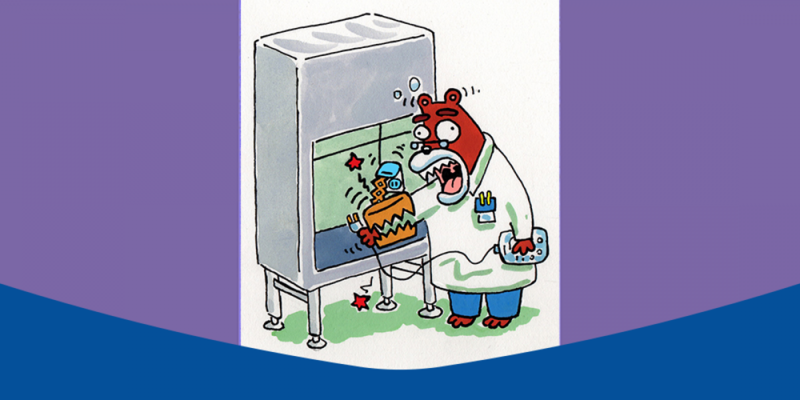 The most advanced Biological Safety Cabinets in the world incorporate many elements that have been gradually designed by the pressures of history, and other elements which were innovated by pioneering engineers. The Purifier Logic®+ design team scrutinized every biological safety cabinet, intent on finding, designing and integrating the best possible features. The Result? Decidedly the most extensive human factors package, Inclination™ Technology, and the MyLogic™ Operating System. History carried Labconco through a vast evolution of Human Factors/Ergonomic design. The first Class II Biosafety Cabinets resembled fume hoods in general appearance. They were console units with 90° vertical safety glass sashes, which would not fully close when the BSC was not in use. The flaw in the design was that microbiological tasks tend to require significant time to perform, and the work can be highly repetitive in nature. Standing at a BSC of this type all day is an exceedingly unpleasant task, which puts substantial strain on the back, legs, arms and neck. In 1983, Labconco released the first of its Purifier Series Class II BSCs, the first BSC of its kind, designed for a seated operator. A reconfiguration of internal systems allowed the BSCs to be bench-mounted, and simply tilting the sash 10° from vertical permitted a researcher to sit with her legs comfortably below the BSC, placing her much closer to her work, improving working posture, reducing arm fatigue and reducing many task risk factors. Furthermore, the angled sash decreased the reflection of light, eliminating glare. The changes brought on by the Purifier cabinet addressed the immediate comfort needs of users, and were quickly adopted by other industry leaders. Never satisfied, Labconco enlisted the assistance of a Human Factors Practitioner, and consulted with several microbiologists to once again bring progress to biosafety. The 2000 release of the Purifier Delta® brought to the industry a new standard for Human Factors/Ergonomic (HF/E) design. The Delta’s preeminent design brought unprecedented comfort to almost every user. Unlike previous BSC’s that were designed for the average sized user, the Delta was optimally designed around users between the 2.5 and 97.5 percentile for height of both men and women (Labconco & Erickson-Harper, 2003). To achieve this optimization, Labconco attempted to build a cabinet around a human operator. This meant addressing each and every risk factor identified by the Human Factors Practitioner and microbiologists. To alleviate lower limb discomfort, the air inlet grille was elevated and curved, building in an arm/elbow rest. A second row of slots was added to ensure continued safe airflow when the user’s arms were at rest. Before 2000, the use of ultraviolet (UV) light in cabinets was handicapped by the inability to fully close the sash. The new sash, still tilted, closed fully and the counterbalanced, anti-racking design ensured easy, smooth movement. The inclined sash could be operated by any user with a single finger, anywhere along the width of the sash. To better accommodate different body sizes and heights, the Purifier Delta came in two different nominal sash heights, 8” and 10”. The sash handle extrusion was substantially reduced in width to maximize sight lines into the BSC (Labconco & Erickson-Harper, 2003). The total depth was configured to allow for comfortable reach distances anywhere in the cabinet, while not feeling claustrophobic (the Purifier Delta boasted the largest cubic foot volume of any Class II). The work surface was designed for easy cleaning and to be removable. Today, it continues to be the only work surface that is a single piece of stamped stainless steel. This requires no welding, removing all seams, and provides for a dish with perfectly radial edges. The last piece of the puzzle involved changing how the user and BSC controls interacted. First, the analog pressure gauge used to indicate safe cabinet performance was transplanted from its position in the header panel, above the sash and out of view of the user, and instead integrated with the Delta’s interior for easy viewing (at line-of-sight while seated). The BSCs controls were also removed from the header panel and placed on the right hand corner post, removing the need of the operator to stretch above their head to control cabinet function. Utility service valves (fixtures) and internal electrical outlets were moved forward, toward the operator, and up on each side wall within close reach and out of the way of manipulations at the work surface. With these changes, all BSC controls and gauges were compliant with the American with Disabilities Act (ADA) and accessible by wheel chair bound users (Equal Employment Opportunity Commission and the U.S. Department of Justice, 1991). Finally, innovation in the HVAC industry caused another punctuated event in the evolution of HF/E design in biosafety cabinets. To increase the basic safety of BSC design, Labconco engineers incorporated an Electronically Commutated Motor (ECM) driven blower into the Purifier Logic®. This motor technology comes with a host of advantages over previously used motors (Hunter & Rouse, 2008). 1. The design of the ECM is much more efficient than that of other motor systems. 2. The ECM can be paired with a monitoring system that can be programmed/trained to provide valuable status information. Traditional motor systems required the induction of magnetic fields to turn the blower, a by-product of which is heat. Subsequently, the air moving through the cabinet would heat, causing sweating, discomfort and fatigue of the researcher. The ECM does not require this magnetic induction and therefore does not heat up, maintaining ambient temperatures. Also, a provision of the ECM’s design and efficiency is a reduction in the noise emitted from the motor blower. Operators realize a 50% reduction in noise levels when BSCs utilize an optimally sized ECM. The Logic continued to add value to the HF/E efforts of Labconco when the antiquated analog gauge was replaced by a Digital LCD display (mounted at line-of-sight while seated, of course). Icons were utilized for at-a-glance monitoring of critical working parameters including filter loading, airflow disruption, and cabinet component functions. Furthermore, a status line gives descriptive feedback on system conditions using words, replacing the commonly used but vague red indicator light and buzzer, the minimum requirements of BSC safety standards. The microbiologists Labconco consulted also expressed the need for a cabinet to clearly communicate when the HEPA filters require service. The HEPA Filter Life Remaining gauge (expressed as a percentage) delivers an accurate, real-time evaluation of filter life. This is only made possible by the incorporation of the ECM (Hunter & Rouse, 2008). Together, these developments have once again allowed Labconco to stay at the forefront of BSC design, and once again, produce a new cabinet which will revitalize human factors design in microbiology and biosafety.